Demolition came about in 2000 after an idea Brian Castillo had on a road trip with Jason Enns and Kris Bennett in Ashland, Oregon. All three felt the need for a new parts brand due to the lack of rider owned and designed parts for the core riders at the time. The lack of brands and owners of current parts brands during this period were middle aged men that lacked soul and history in bmx that all 3 felt were lacking by their current sponsors. 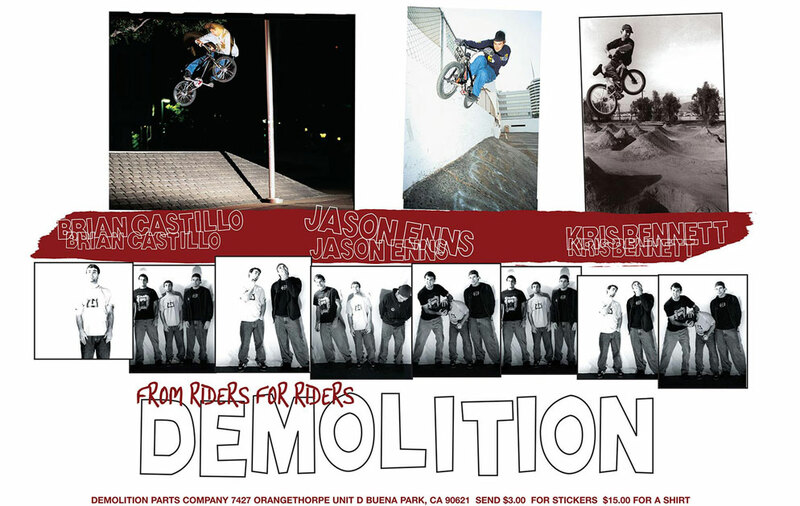 From that trip, Demolition was formed and Jason and Kris Bennett were obviously the first riders on team. The 3 were ahead of the curve when it came to diverse pro riders at the time, all 3 ruled street, dirt, ramp and formed everlasting history from each one of their video parts and print magazine photos and articles. The parts that were designed from Demolition at the time were built around the 3 riders and what they liked and dreamed of riding that their previous sponsors didn’t make. Today the Demolition team is still just as diverse as the first 3 riders, and the parts are still designed from riders for riders.